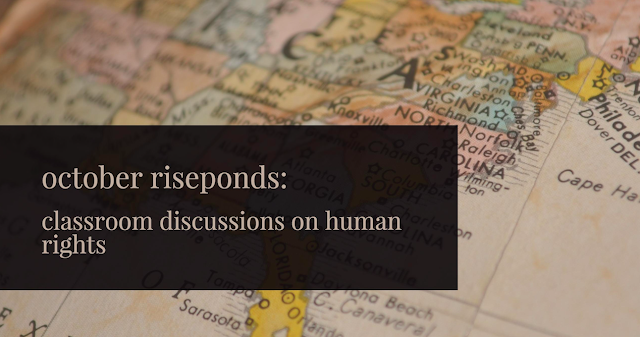 This month, we’re talking about human rights being used as topics for classroom debates. Is this okay? Do we tend to discuss sensitive subjects as if nobody is affected by them? How can we and our teachers make such discussions more positive and less uncomfortable for marginalized students? Simone: Personally, I find this topic incredibly conflicting. On one hand, I see in-class discussions to be a valuable space to speak openly about injustices and to educate those who don’t know what others are going through; on the other hand, though, as a minority student myself, it can be very alienating to suddenly be made the spokesperson for protecting human rights. There have been many times that I’ve been the only person of color in the room when discussing an issue that directly affects me, while my white peers debate the topic as if it were an abstract concept, not understanding the reality of the situation. Sometimes, I wish the discussions simply didn’t take place, but I feel that it’s imperative for me to use my limited platform to try to broaden my classmates’ world view. From a student’s perspective, I think it’s always important to listen to everyone’s point of view, but also to offer our own personal stories if we feel comfortable, as they can be poignant reminders of the humans behind the topics we discuss. I think to really make a classroom a comfortable space, teachers need to be careful to allow a difference of opinion while not letting students dehumanize one another or forget that, whatever the issue, people are going to be affected. Emily: I agree with Simone, as this topic can be good for opening minds, but it can also give people with more prejudiced views a chance to voice opinions are less helpful and more demeaning or offensive to others. I’ve experienced being in a classroom while a topic I feel strongly about is being discussed even less passionately than about what the teacher is going to do at the weekend. Moreover, I personally feel if the teacher is going to bring up such a complex and quite personal topic for some people, then it needs to be a discussion – including an opinion from everyone and the freedom to say what you believe, within reason of course (nothing that is dehumanizing or degrading towards others). Additionally, not everyone may want to take part in the conversation. Therefore, there must be measures in place that provide those who don’t want to take part in the conversation, or feel uncomfortable, an alternative, but also to make sure nobody in the class is deliberately expressing views that will make others feel targeted or segregated. Teachers can have a significant influence on the way their students think, so teachers must articulate what they say with care – making sure they let the students know it’s just their own view, and everyone has their personal opinions. However, the idea of teachers having a say in the discussion can be problematic, because even though we expect them to be respectful of everyone in the class and have views that are deemed in modern society as fair, the ‘correct’ view can be thought of as subjective. This could lead to a teacher perpetuating out an opinion that could be harmful to some people through the students. Amelia: Talking about human rights in schools is undeniably important. However, using them as materials for class debates can become problematic. In school, whenever LGBT+ rights came up as a discussion topic, it felt very, very alienating, since I’m bisexual. The topic was always presented as detached from reality - as if nobody in the room could ever experience homophobia, or biphobia, or transphobia. As if the statistics of mental illness within our communities aren’t the result of the very things people in the class were encouraged to discuss: Leviticus 18:22, being gay is unnatural, the works. These statements weren’t treated as discriminatory, but as “opinions”, as “opposing views”, and never challenged by the teacher. When they are accepted in class as simply harmless statements that don’t bear any implications in real life, then they are normalised. Discrimination and prejudice should not be normalised: they should be called out at every opportunity. Minorities exist in your classrooms, too, not just your textbooks. Ruthie: One day a few weeks ago my brother came home from 5th grade and told me he got in trouble for kneeling during the Pledge of Allegiance. “Rue, how can I say the Pledge if not everyone is treated the same?”, he said to me, and in that moment I felt pride and anger all at once. I felt anger at the teacher, who, instead of using this as a teaching moment, quickly admonished my brother and his classmates and yelled that they didn’t even know what they were kneeling for. Oh they knew. This predominantly African American class at an inner city school in Chicago knew exactly why they were kneeling. We absolutely have to discuss the hard things in our classrooms, because that is where a kid forms their values outside of the home. If a child is curious, opinionated, brave, and outspoken, conversations need to be started instead of shut down. These children are our future, and human rights (or lack thereof) aren’t going anywhere. It is the duty of educators to educate on the people’s experience, on empathy and freedom, and most importantly, on acceptance. Little kids are more aware than many think.